“Insurance companies are not God." People injured in car accidents wherein the insurance company denied their case need to remind themselves of this fact. It is also highly likely one of our personal injury lawyers will remind you of this fact upon speaking with them. Always remember, just because the insurance company denied the claim, it doesn’t make them right. There are many reasons claims are denied by insurance companies and it is not always based on the merits of the case. In many cases the denial is not the last word but the first before a lawsuit is filed. Regardless, many times the reason for the denial is irrelevant as the final decision maker is not the insurance company but the Judge and jury. This article will examine the most common reasons and discuss your options if your claim has been denied. Insurance companies are in the business of making money. It is a simple principle but one many individuals easily forget when they are going through the emotional and physical “trial” following a car accident. One of largest expenses for insurance company is the payout of claims. If the carrier believes they have a shot of winning the case (even if it is a small percentage) they will deny the claim. Once the claim is denied the ball is in the individual’s court to either walk away or fight. Unfortunately, many people walk away. They are usually dissuaded from fighting against a very large and well-funded opponent. One of the most common reasons insurance companies would deny your claim in North Carolina is contributory negligence. Contributory negligence is covered in great detail in another article; however, put simply, this is where the negligence of the claimant (plaintiff) combines with the negligence of the defendant to cause the car accident. Insurance companies are profit seeking (many times publically trading) companies. Other than claims, employees are their largest expense. Like in many industries, they prefer younger, less experienced and therefore less expensive employees. This results in many claims being denied for contributory negligence because the adjuster doesn’t understand the practical application of this theoretical legal concept. 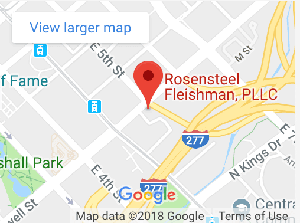 Each personal injury attorney at Rosensteel Fleishman has settled or won at trial claims, which had been incorrectly denied based on contributory negligence. Another common reason to deny a claim is because the claim is it is too large for the insurance carrier. This is often seen in catastrophic cases where an individual is badly injured. In these cases, the insurance company prefers not to move forward without the assistance of defense counsel. In many of these cases a technical defense is found and used by the insurance company as a way of reducing the overall value of a case. The insurance carrier is attempting to play on the Plaintiff’s risk eversion or fear of getting nothing. Many times cases are denied by the insurance carrier because the adjuster is unwilling to properly investigate the claim. Proper investigation includes speaking with all witnesses, securing video surveillance, scene investigation, officer interviews, and forensic engineering review i.e. reconstruction. A denied case in point (which we resolved in 2017) occurred when a commercial vehicle entered an intersection striking a passenger vehicle, killing the driver. The driver of the passenger vehicle’s blood alcohol content “BAC” came back at .10 above the legal limit of .08. Unfortunately, the adjuster failed to do any real investigation short of listening to their driver’s story and looking at the toxicology report of the deceased driver. Our office retained an engineer to do a full reconstruction showing that the deceased driver entered the intersection on a green light. Further, the reconstruction conclusively proved that the deceased level of intoxication was not a contributing factor (i.e. not contributory negligence). Finally, we were able to show that the blood secured by the pathologist was not properly stored thereby invalidating any BAC found by the state. This denied claim resolved for multiple millions of dollars prior to trial. Many times a claim is denied to simply test the client’s resolve. We understand that it is emotionally trying to file a lawsuit and spend at least a year of your life fighting when the odds are against you. Many people look to avoid confrontation if they can. Insurance companies are aware of this as well and attempt to exploit it. The adjuster’s internal calculus is that if they deny 10 claims some of the denied cases will remain closed with no further action. Some of the cases the individuals with fight and win, and they will pay out what they should have in the first place. Finally, some of the cases the individuals with fight and lose, and the insurance companies will look to recoup they expenses against the other party. Oddly enough, because of caps put in by the NC legislator in 2011 there is a perverse incentive for adjusters to deny larger claims then smaller ones. The reason is that NC fee shifting statute requires the insurance company to pay the Plaintiff’s attorney’s fee if the award is less than $25,000.00. The attorney fee is now also capped at $10,000.00. This means that if the jury awards more than $25,000.00 the insurance company is not required to pay the Plaintiff’s attorney fee. Many cases are denied when the at-fault party can point the finger at another defendant. This is usually a short sighted defense and one that can inflame a jury against the defendant. While this is no solace to the injured Plaintiff who is faced with a long emotionally taxing lawsuit this is typically the weakest denial. Many times, the defendants, faced with the prospect of getting punished in trial settle the case after suit is filed. By that time however, the insurance carrier has spent money on defense counsel and usually overpays on the value of the case to get it resolved. Some cases are denied simply because the insurance adjuster misreads the police report. Usually this occurs with a younger less experienced adjuster. Many times this denial can be overturned and changed to an accepted claim once the attorney speaks with management. Our lawyers have annually won millions dollars for clients on denied claims. Many of our most successful clients were turned down or released by other personal injury lawyers once their claim was denied. In many cases the best advice we can give to prospective clients is to speak with our attorneys as soon as practicable following the accident. This allows our office to examine the evidence and secure statements and video while available and fresh. The other take away from this article is that clients should not get dissuaded from moving their case forward just because the insurance company denied their case. Many times the denial is wrong and can be successfully fought and won. If you case has been denied we invite you to contact us to discuss your case. There is no fee to talk with a personal injury lawyer regarding your car accident. You will speak directly with a lawyer who can assist you with your case.